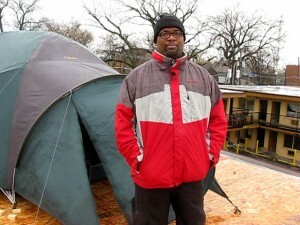 In an effort to bring attention to violence in Chicago’s Woodlawn and Englewood communities, a local pastor has decided to camp out on the roof of an abandoned motel for 21 days, or until enough funds are raised to buy the motel and transform it into a community and economic development center. “We’re trying to raise the funds, $450,000 so that we can purchase this motel, tear it down and do something economically that will be a blessing to the community,” said Corey Brooks, pastor of New Beginnings Church, 6620 S. King Drive, during a Nov. 22 interview on top of the former Super Motel, located across the street from the church. During the rooftop interview, members of Brooks’ church – which has over 3,000 members – were using a lift to haul electric heaters and other items onto the roof to help the pastor while he lives in a tent they had set up on top of the motel.